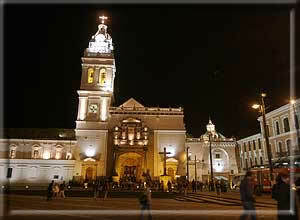 This three hour sightseeing excursion offers the best of Quito with its rich cultural legacy, ornate facades, and dazzling gilt altars Visit the Independence Square , The Archbishop’s palace, The Metropolitan Cathedral as well as other very representative samples of colonial art and architecture. 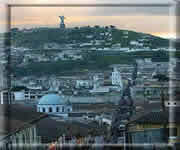 At the end, drive to the hill of Panecillo for a panoramic view of the city. 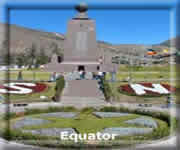 Just 30 minutes outside of Quito , visit “ La Mitad del Mundo” (Middle of the World), marks 0 latitude and take advantage of the opportunity to stand on both hemispheres at the same time. 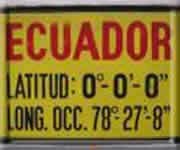 Visit the Equatorial Museum featuring a complete sample of Ecuador"s different ethnic groups. Visit the famous Equatorial Monument , where will have the chance to see a colonial model village located just at the Equatorial Line, marked by geographers as latitude 0.0.0”. 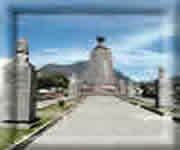 A visit to the museum could be included, this museum featuring Ecuador "s ethnic groups from Galapagos to the Amazon. 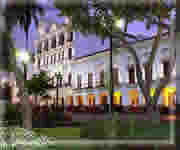 The Archbishop’s palace, The Metropolitan Cathedral as well as other very representative samples of colonial art and architecture. At the end, drive to a local restaurant for a fixed menu dinner. 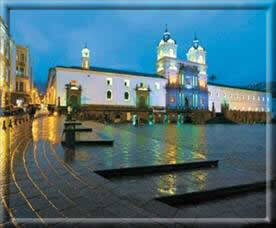 An early start, to travel north of Quito to the province of Imbabura , a magical land of lakes. Just before arriving to the famous Otavalo market. The Otavalo Indian market, dates back to the pre-Inca times and is famous for its textiles woven on blackstrap and shuttle looms. The market is piled high with ponchos, hand made textiles, hats, indian jewellery, and various handicrafts. Will have time to wonder around the market. Lunch will be served at one of the Hosterias of the area. Afternoon if time permits visit to Cotacachi an artisans centre known for its leather woods or San Antonio de Ibarra where the highlight are the wood-carvings. The Antisana volcano is the fourth highest mountain in the Ecuadorian Andes. Massive glaciers feed water to lakes and rivers of the reserve, which sustain the abundant wildlife of the region. Fifty percent of the Andean Condors that live in Ecuador have chosen Antisana as their home, as well as many other spcies of highland birds. Only an hour away from Quito, Antisana is one of the most spectacular natural reserves to visit and see multicoloured flowers, cushion plants and terrestrial bromelias. Lunch included during excursion. Papallacta is privileged located in an area between two Andean-Equatorial majestic volcanoes; namely, Cayambe and Antisana . The thermal waters feeding the Papallacta fountains emerge from deep geological layers through fissures up to the surface with all its healthy p roperties. We will arrive to Termas de Papallacta spa & resort, located on the "Cinnamon Trail", the same route that the Spanish conquistador Francisco de Orellana followed in 1542, leading to his discovery of the Amazon river . Termas de Papallacta hot springs spa & resort serves as the gateway to the Ecuadorian Amazon region. All air tickets and taxes are subject to change without previous notice. The program is subject to the general terms and conditions of Galapagos Divers Inc.
Airport Taxes: Ecuador , USD40.00 per/person for international flights, Peru , USD 6.05 per/person for domestic flights, USD30.25 per/person for international flights, Cancellations for mainland services: 30 days prior passenger’s arrival no cancellation fees; 29-15 days prior to passengers arrival 50% cancellation fee and 14-0 passengers arrival 100% cancellation fees. Booking and cancellation policies for Galapagos cruises or programs will be notified with each confirmation.